You will probably be wondering who I am and what business I have, writing to you.- I am one of the millions of soldiers of the United States Army, who is fighting for all the oppressed peoples of the world and hopes to have reestablished decency and honor to all mankind, with the defeat of Hitlerism. My friend Varda in Israel sent me a copy of this letter she recently received from the widow of Mr. Shmuel ‘Tommy’ Huppert of Israel. 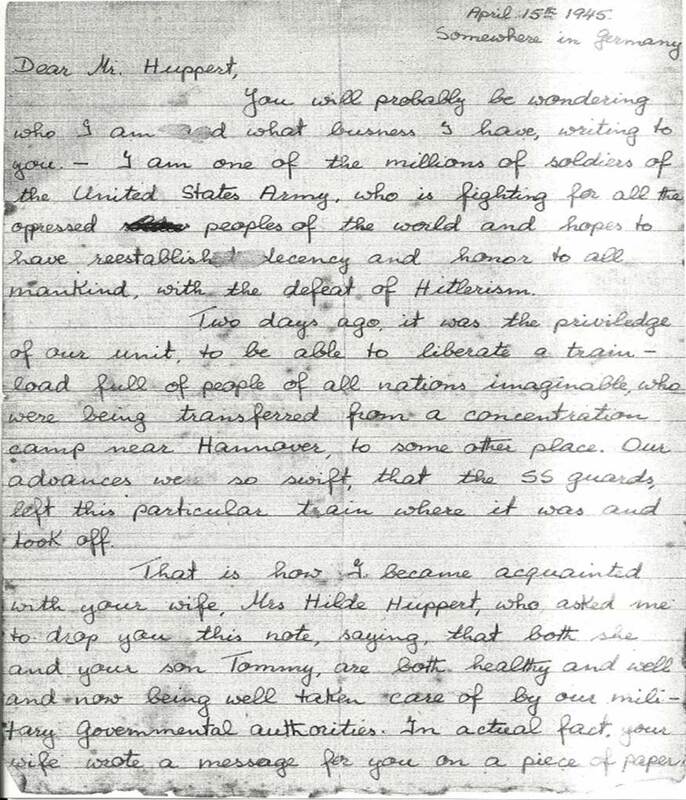 In it, an American soldier is taking the time to write to the husband of a Holocaust survivor to let him know that his wife and young son (Tommy) have been liberated, and that they have survived the horrors of the Holocaust and the carnage of ‘Hitlerism’. Young Tommy and his mother, Mrs. Hilde Huppert, were liberated at Farsleben on the transport from Bergen Belsen on April 13th, 1945. They managed to get to Palestine shortly after liberation, bringing with them many, many orphaned children, including my friend Lily Cohen. Hilde’s manuscript, Hand in Hand with Tommy, was one of the first Holocaust memoirs completed after the war and a cathartic way for her to attempt to come to terms with what had happened. One of the soldiers, on the Sunday following the Friday liberation, took the time to send this note on her behalf to her husband in Palestine. It now resides in the collection at Yad Vashem, Israel’s Holocaust Remembrance Authority. Two days ago, it was the priviledge (sic) of our unit, to be able to liberate a trainload full of people of all nations imaginable, who were being transferred from a concentration camp near Hannover, to some other place. Our advances were so swift, that the SS guards, left this particular train where it was and took off. That is how I became acquainted with your wife, Mrs. Hilde Huppert, who asked me to drop you this note, saying, that both she and your son Tommy, are both healthy and well and now being well taken care of by our military governmental authorities. In actual fact, your wife wrote a message for you on a piece of paper in pencil, which she asked me to convey to you. Unfortunately, however, the penciled lines faded in my pocket, and I can no longer read what was written on it. The contents of the message, though, was to let you know that your wife and son are both safe and sound. I am sure that your wife will soon be able to get into contact with you directly through the Red Cross, and I hope that in a none too distant future, your family will once more be peacefully united. Fluent in many languages, Gartner was the translator for the 743rd Tank Battalion’s commander, Col. Duncan. He was originally from Estonia, and resided in Los Angeles, California. If anyone knows more about Frank Gartner, please leave a reply on this page. More can be found about the 743rd Tank Battalion in their regimental history, which can be downloaded here. Transcribed by Alanna Belanger’15 and Alexis Winney ’15.